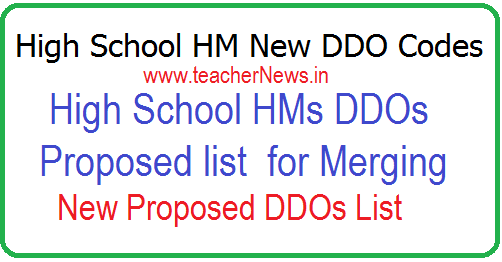 High School HM New DDO Codes - List of HS HMs DDOs Proposed for Merging : Rationalization of DDOs in the School Education Dept Proceedings and List of New Proposed DDOs. Rationalization of DDOs in the School Education 4633 high school DDO codes to 666 MEO DDO codes as per Memo.20027. List of HS HMs DDOs Proposed for Merging New Proposed DDOs List for High School HMs. Memo 20027 Rationalisation of DDOs in the School Education Department. HoDs are requested to examine the feasibility of reducing No of DDOs and to furnish proposals for rationalization of DDOs. Rationalisation of DDOs in the School Education Department. The Government has agreed the proposals of rationalization of DDO codes from 4633 high school DDO codes to 666 MEO DDO codes. 1.In the references 1st and 2nd cited the HoDs are requested to examine the feasibility of reducing No of DDOs and to furnish proposals for rationalization of DDOs in their control will relevant Information. List of HS HMs DDOs Proposed for Merging High School HM New DDO Codes. Rationalization of DDOs in the School Education Dept Proceedings and List of New Proposed DDOs.